Reserve parking for all Columbus Clippers games at Huntington Park. The Columbus Clippers are a minor league baseball team in Columbus, Ohio. The team is owned by the government of Franklin County and was once voted one of the most valuable franchises in Minor League Baseball. Don't miss a Clippers home game and guarantee your parking spot with reserved Clippers parking online. The team began play in 1977 as an affiliate of MLB's Pittsburgh Pirates, and then changed its affiliation in 1979 to the New York Yankees until the relationship ended in 2006. The team continued play as an affiliate for the Washington Nationals from 2007 to 2008, and is currently an affiliate of the Cleveland Indians. Notable alumni who have trained with the team include Robinson Canó, Derek Jeter, Don Mattingly, Charles Nagy, Andy Pettitte, Jorge Pasada, Dave Righetti, Mariano Rivera, Buck Showalter, and Bernie Williams. 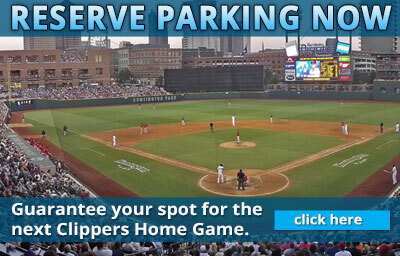 Parking in Columbus for Clippers games is easy with convenient Parking.com locations close to Huntington Park.